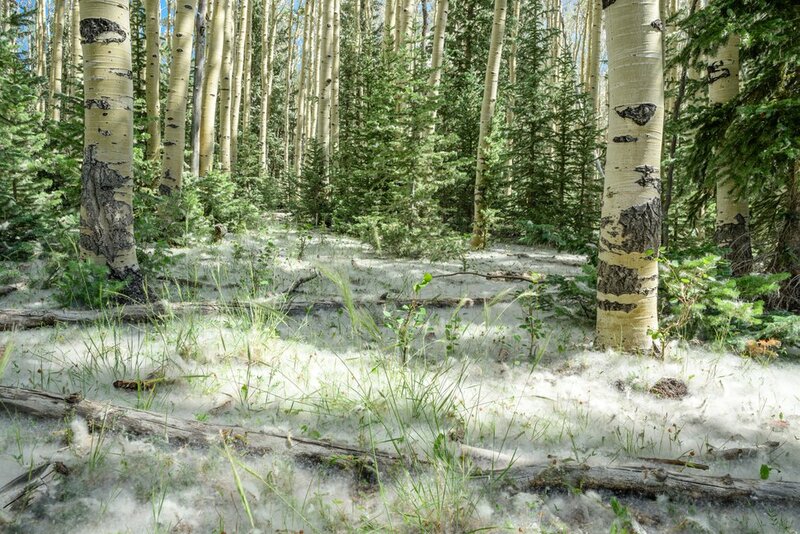 Brian Head • This past summer, a year after 72,000 acres of high-elevation woodlands burned around southwestern Utah’s Markagunt Plateau, residents of the nearby resort town of Brian Head noticed something strange: Tiny white cottony puffs drifted through the air and piled up on the ground like a downy blanket. It smacked of Christmas in the middle of July, but the fluffy stuff was not snow. The mysterious material, which even longtime residents had never seen before, turned out to be seeds exploding off thousands of aspen trees that survived the 2017 fire. Now tiny plants from those seeds are springing up from the ground, along with millions of aspen shoots suckering off existing roots. Aspen is well-known for rebounding quickly after fires, but some Utah scientists are marveling at the extent of the sudden growth in areas scorched near Brian Head. Karen Mock, a professor of conservation genetics at Utah State University, learned of the seeding phenomenon from Saemisch and toured the burn region with him in July. Photo courtesy of Mike Saemisch. Cottony aspen seeds blanketed the ground around an aspen stand near Brian Head last July, a year after the region burned. Utah State University scientists are studying the icon tree's robust return following a wildfire that blackened 72,000 acres. The last time a major aspen seedling event was documented in the West was in the late 1980s after the massive Yellowstone fires. Quaking aspen is a keystone tree species in Western ranges, but these stands, vital to forest health and biodiversity, are in steep decline. Scientists like Mock and USU ecology professor Paul Rogers are searching for answers in hopes of reversing this alarming trend. The Brian Head burn could provide clues. 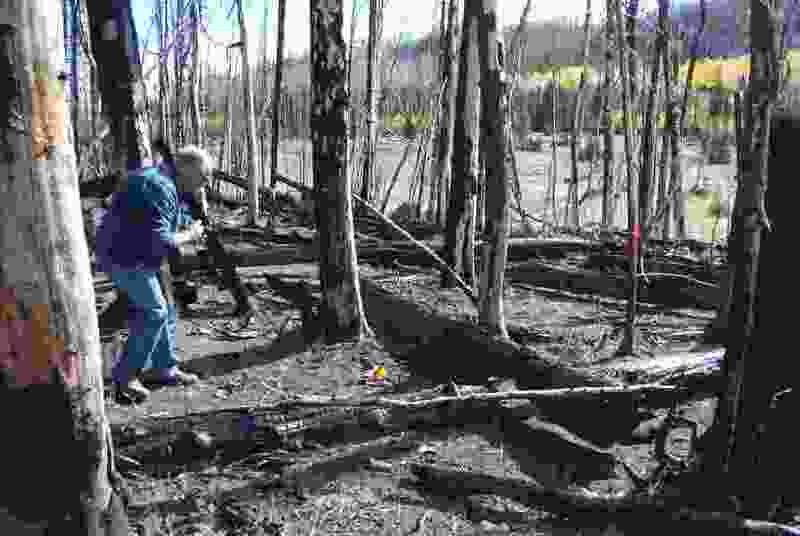 Walking around the charred area last summer, Mock was both thrilled and mystified by the tiny seedlings popping from the blackened ground around snags and under downed trunks. Growing flat to the ground, the seedlings don’t even resemble aspen, unlike the year-old suckers that were already 2 feet high. Tribune photo by Brian Maffly, Sept. 25, 2018. 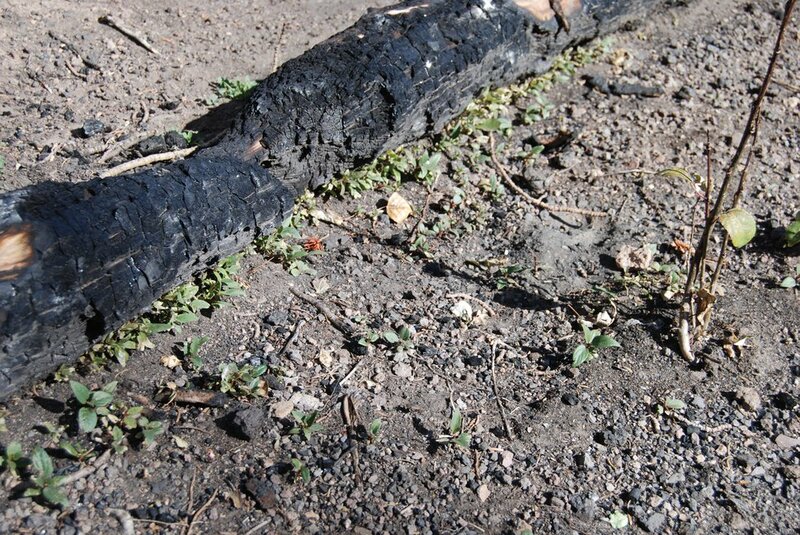 Aspen seedlings sprout underneath a burned log from the 2017 Brian Head Fire in southern Utah. Utah State University scientists are studying the robust resurgence in aspen growth a year after the fire scorched 72,000 acres. They hope research will help find ways to reserve the iconic tree species' decline. Environmental conditions are morphing unnaturally fast in Western mountains, and a deeper gene pool will help tree species adjust to these changes. But aspen usually propagate through suckered clones that are genetically identical to the mothership root network. 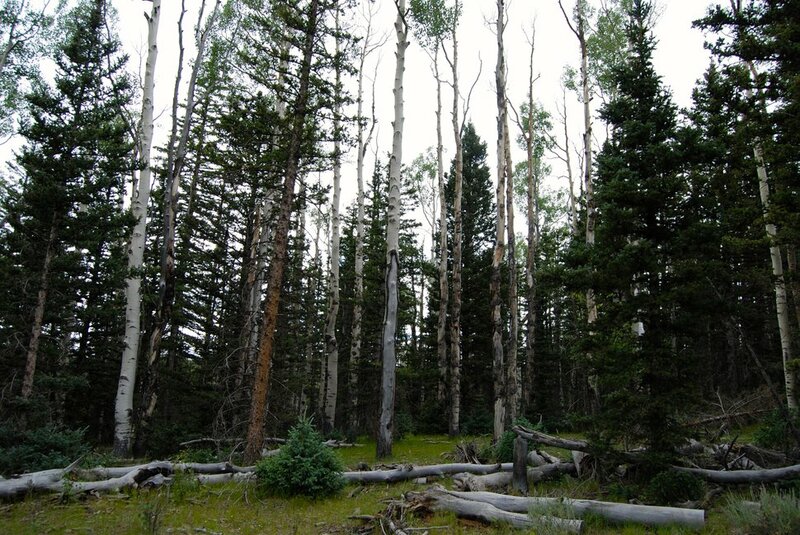 The resulting lack of genetic diversity could doom aspen and the ecosystems these trees support. Utah’s famed Pando stand, believed to be the largest organism on Earth, is such a clonal monolith. Mock and USU colleague Larissa Yocom have set up an experiment to observe how well nursery-raised aspen seedlings grow on ground burned in the Brian Fire blaze. Volunteers planned to plant 2,500 tiny trees inside five fenced-off plots, known as “exclosures," this week, but new snow punted the project to next spring. Once the trees are planted, though, scientists, with the help of locals like Saemisch, will track their progress. Utah’s state tree, the quaking aspen is in steep decline across its native range due to a combination of factors, including fire suppression, livestock and big game grazing and, of course, climate change. Across Utah, conifers have encroached into aspen stands, often filled with aging trees that aren’t being replaced by younger ones. Mock hopes the suckers proliferating in the Brian Head burn will provide elk and cattle plenty to eat, giving the seedlings a chance to grow. Fire has long been known to unleash suckering in aspen, but there is no known association between fire and seed production. It could be a coincidence that the Brian Head aspen seeding phenomenon came a year after the big blaze. Mock theorizes that environmental stressors, like smoke or drought, may have triggered the seed explosion. Last year was Utah’s driest on record, coming on the heels of five consecutive years of below-average precipitation for the state’s southern stretches. The Brian Head Fire destroyed several homes, contaminated Panguitch’s water supply and wrecked several trout fisheries in tributaries to Panguitch Lake, but some ecologists contend such destruction may be necessary to restore Western forests degraded by past fire-suppression and logging policies. Western politicians, however, often blame poor forest health on a lack of “active management" and contend logging would restore not only woodlands but rural economies as well. Forest ecologist Chad Hanson fears a return to rampant logging, or even selective logging, could make national forests less healthy and more prone to destructive blazes in the long run. Hanson contends excluding fire from the landscape has long disrupted the natural rhythms of many Western forests, leading to the loss of millions of acres of aspen and a decline in overall forest health. Aspen stands harbor more biodiversity than any other tree species, help retain water in the ground and fend off flames. Tribune photo by Brian Maffly, Sept. 25, 2018. 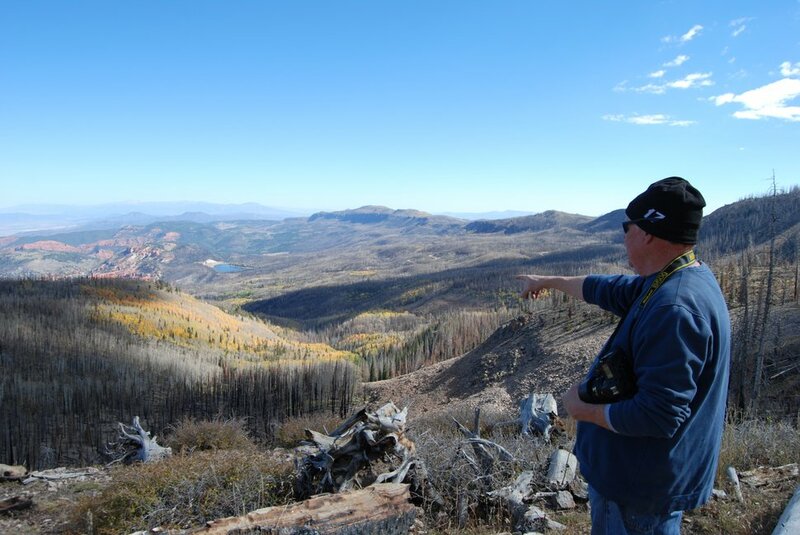 Brian Head resident Mike Saemisch points out a stand of unburned aspen, middle distance, near Yankee Meadows, an area severely burned in last year's Brian Head Fire. Saemisch is helping Utah State University scientists study the iconic tree's robust return following the fire that blackened 72,000 acres. Aspen are also better at withstanding fire. For evidence of this, walk through the Brian Head burn. Next to conifers killed by flames are stands of aspen that failed to burn completely or at all. These survivors are now repopulating the terrain stripped of living trees and setting the stage for a richer, if different, forest future. Tribune photo by Brian Maffly, July 31, 2015 Conifers encroach into historic aspens stands on Utah's Aquarius Plateau, displacing the iconic tree. The aspen pictured here are nearing the end of their lives, but are not being replaced by younger trees. All over the West, fire suppression, climate change and grazing have contributed to the decline of aspen by disrupting regeneration.